Found at chrysalis & protected until butterfly - Tabitha admires this Honduran beauty. As for me, may I never boast about anything except the cross of our Lord Jesus Christ. Because of that cross, my interest in this world has been crucified, and the world’s interest in me has also died. It doesn’t matter whether we have been circumcised or not. What counts is whether we have been transformed into a new creation. May God’s peace and mercy be upon all who live by this principle; they are the new people of God. but to become Godly, faithful young men. Lesly, Tania, Lucinda and Marillyn serve the soccer families. PRAY for the outreach & discipleship ministry of Filipenses F.C. Many of these boys have no godly role models in their lives. Jose Manuel and Nexser receive cleats and Bible books for their winning of the most faithful player award. This award is received by the most consistent attendance to practice (twice a week) and games. receive team jerseys as a token of appreciation. and instructs the trade school girls how to run the floor. so that we might gain a means to address their spiritual needs. The Rancho Oasis Rummage Sale always draws a crowd. are in turn blessed with some more extra ministry funds. The Family enjoys a wild range of flavors on our way to the Honduran Missionary retreat. Our kids are great at overstimulating their little sister! Poema's pure joy is found in her laughter! 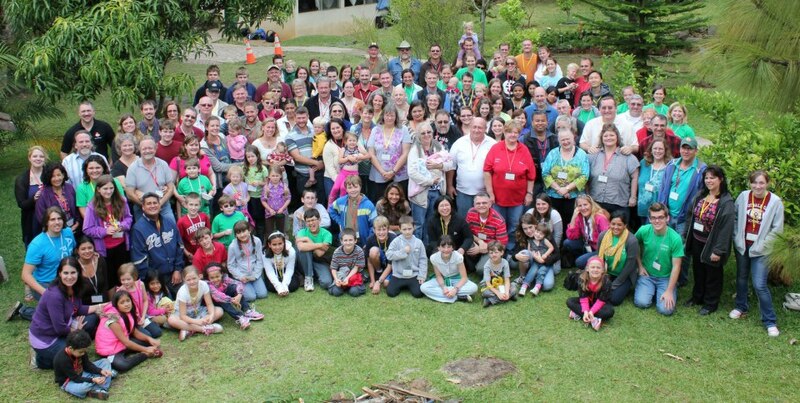 Group photo from the 2013 Honduran Fellowship of Missionaries and Ministries Retreat. Can you find the Beard family? rejuvenate and cast vision for God's heart for Honduras. PRAY for this nation and it's missionaries! PRAY for these girls to know Jesus and have a passion for the lost. with our hometown rivals and an orphanage. Running errands with Dad - exchanging the propane tank. Reading through the book of Acts with the teens. as we pursue reading the New Testament in a year! walk with Jesus! The first year in the field is typically the hardest. The inductive Bible study method is revolutionizing Oscar's understanding of the Word! PRAY for Oscar to develop into the Godly leader that God desires for him to become; he has been an amazing part of Rancho Oasis and a spiritual son. Couldn't quite get Lissye's, Ilsy's daughter, and her toothless grin! Pineapple Marmalade with the trade school girls - Que Rico! new believer's curriculum called New Life in Christ. and into a genuine relationship with their Maker. The three newest additions to the Ranch - our mouseketeers! as we move to a larger property in the coming months! Clean country air, friends and a little bit of fun is good medicine for these city orphans. but a broken spirit saps a person’s strength. Lu reads to the little boys and Oscar converses with the older boys. Growth in the boy's Bible study lead us to divide the group into two new age groups: 5 - 7 and 8 - 12. We also added many new missionary biographies and children's Bible story books to the Ranch's library. After our traditional time in God's Word, we would read from these books to give the boys a bigger sense of God's world. Once a month Tegus shopping in Pricesmart with Tobias. Pricesmart is similar to Costco or Sam's Club. Off-week "friendly" soccer game with a children's home in San Buenaventura. Oscar gives the boys instruction before the game begins. "La Barra" or fan club for Filipenses F.C. Ilsy sits with Tania and Kenya, two older sisters of one of the soccer boys. Teen Bible study reading through Luke. We committed to read through the New Testament in a year. Naomi and Tabitha spend some extra time with their grandpa, Wayne Goranson. victory of the 2014 world cup elimination rounds: Honduras 2 - USA 1. Shaking hands before the first of two soccer tournament semi-final games. We won the series 6 - 5 in penalty shoot out! I was so into the shoot out that I forgot to take pictures! Our Dry Composting Latrine community informational meeting. Jon was sharing this hygienic solution with families that had old or run down latrines. Oscar shares his heart during the first trade school public meeting. We were overwhelmed by the interest from the young people in the community.